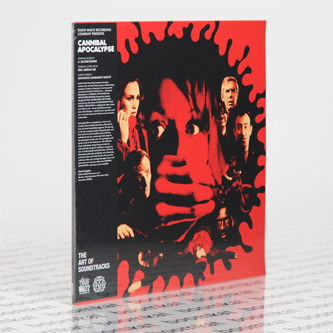 "Death Waltz Recording Company has taken another step into the infamous genre of flesh-eating monsters in order to bring you a much-requested score from the field of Italian horror – Alexander Blonksteiner’s CANNIBAL APOCALYPSE (aka APOCALYPSE DOMANI). Directed by Antonio Margheriti (YOR, HUNTER FROM THE FUTURE) and starring John Saxon (A NIGHTMARE ON ELM STREET), APOCALYPSE is a nightmarish vision where two Vietnam vets – Saxon and infamous horror actor John Morghen - unleash horror upon the world via a virus that makes the infected want to consume human flesh. Scoring the film is a soundtrack as intense and crazed as the cannibals themselves, although this may not seem immediately apparent. The opening is a lovely sweeping melody with gentle piano and flute (what is it with cannibal movies and these melodies?) and sets a serene and calm stage for the apocalypse to latch onto. The apocalypse itself scores a nine on the funkometer, with militaristic drums and sinister strings being overtaken by wah-wah funk and guitar noodling in a prog-rock vein. It’s both melodic and dischordant, with harsh alternating synth notes combining with shimmering music box notes, and a love theme with a sax that wails more than your average teenager. If you must chow down on someone, make sure CANNIBAL APOCALYPSE is spinning on your turntable." Red vinyl housed in a reverse board sleeve with cover art by Eric Adrian Lee and a booklet of sleeve notes by star Giovanni Lombardo Radice. One-off edition of 900 copies.